The Samsung Galaxy Note 5 is a great mobile phone with variously advantageous features. There are some features which can benefit the users, and the features are not possessed by other mobile phones. One of the great features possessed by this phone is split screen. By having this feature, the users of the phone can open two separate apps at the same time. So, it will be useful to help the users run two important apps needed at the same time. Then, talking about the split screen, you must want to know how to use this feature. 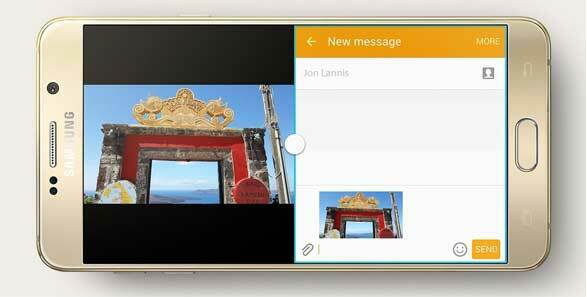 Here are some ways to use split screen on Galaxy Note 5. First, what you need to do is to individually open both two apps that you want to use this feature. Second, open the carousel by using the recent key to the left of the home button. Third, when the previous way is done, you can tap on the Split screen icon next to the X at the top right corner of the app that you want at the top of the screen. After it is done, the app will be opened in the top half of the screen. After that, the bottom half will go on to show the carousel of the app. Then, you can tap any app you want to in the carousel to open in the bottom half of the screen. After succeeding to do the previous step, the bottom app will be highlighted with a line around the edge and a white dot at the top. Then, you may drag the dot to resize the apps to any size you want. After it finishes, you can run two apps you want. Sometimes, people need to run two apps on their mobile phone because they must do it to fulfill their need. In this case, galaxy note five can be the right solution for you.